Since summer 2014, QRP Labs kits have been warehoused and shipped by two part-time ladies in Japan. 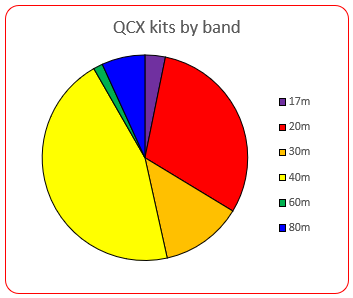 The QCX CW transceiver kit was launched on 21st August 2017, and caused a flurry of orders (which still continues 7 months later). The volume of orders was such that the QRP Labs shipment office was so overwhelmed that a waiting list of up to 8 weeks very quickly built up. At one point in early December there were over 1,000 orders pending shipment. To help deal with the high demand, additional help with shipments was brought onboard in additional locations. But the complexities arising, and the continued struggle to keep up with demand, has clearly shown a more sustainable solution is required, for the continued success and growth of QRP Labs. Accordingly, from the beginning of April, the Japanese shipment office is being closed. Shipments will henceforth take place from KM46. A full-time employee has been recruited for this purpose. We estimate that shipping capacity will be up to 80 shipments per day, or approximately 1500 per month. This is much more than the busiest month to date (August 2017, with 832 orders). We anticipate that other than some short delays of a few days, such as when a rare surge of orders occurs as on 21st August when the QCX kit was released (around 300 orders in 24 hours), it will ordinarily be possible to ship out all orders within 1 business day. Additionally we will be able to put tracking codes on the shipments. There will be a transition period of a week or two where chaos will reign supreme, while we wait for stock to be shipped from Japan and clear customs, and get everything organized. Please bear with us during this exciting period of change, which is necessary for a more efficient QRP Labs future! Many thanks to Rie-san and Megumi-san in Japan who have worked tirelessly and accurately on QRP Labs shipments for almost 4 years, and set a very high standard to uphold. 2. QCX kits pass 4,200! 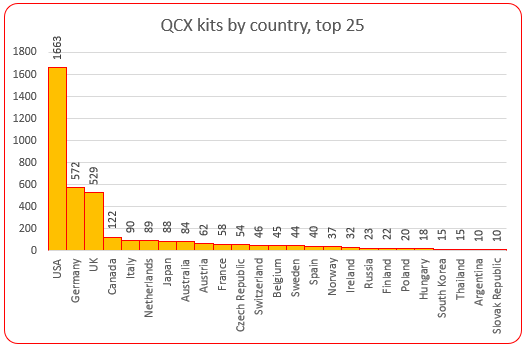 As of time of writing, over 4,200 QCX kits have been ordered, of which 4,011 have been shipped. COUNTRIES: QCX has been shipped to 60 countries to date. The US (43%), Germany (15%) and UK (14%) are the top three. The full list is: Argentina, Australia, Austria, Belgium, Bermuda, Bolivia, Brazil, Bulgaria, Canada, China, Colombia, Croatia, Curacao, Cyprus, Czech Republic, Denmark , Estonia, Finland, France, Germany, Gibraltar, Greece, Guernsey, Hong Kong, Hungary, Iceland, India, Indonesia, Ireland, Israel, Italy, Japan, Jersey, Latvia, Lithuania, Luxembourg, Malaysia, Montenegro, Netherlands, New Zealand, Norway, Philippines, Poland, Portugal, Romania, Russia, Serbia, Slovak Republic, Slovenia, South Africa, South Korea, Spain, Sweden, Switzerland, Taiwan, Thailand, Turkey, UK, Ukraine, USA. 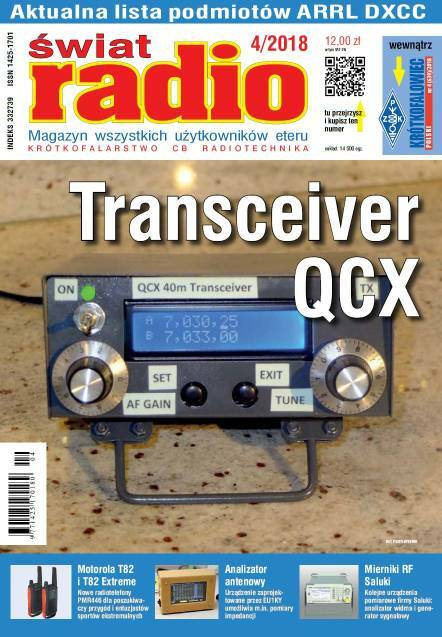 BAND: The QCX is available for 80, 60, 40, 30, 20 or 17m. 40m is most popular (45%) followed by 20m (40%) then 30m (13%). 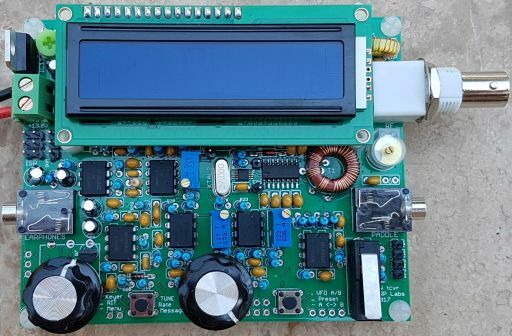 Philip K9PL continued his review series of several QRP Labs products with a nice review of the QLG1 GPS receiver kit on the first page. The K9YA Telegraph is a free monthly Ham Radio eZine, see http://www.k9ya.org/ for details. U3S-22 CIRCUMNAVIGATION flight by Jim N2NXZ continued Last month, I reported on Jim N2NXZ's spectacular circumnavigation flight. At that time, the writing, U3S22 ballon was still flying a little North-East of Moscow. The excitement didn't stop! Many in Europe will remember the very cold weather a few weeks ago, which was said to have come in on an unusual Easterly wind all the from Siberia. U3S22 got caught up in the same pattern! It turned around and flew back West all the way back out over the Atlantic, before turning East again. From there, it continued way East almost as far as Japan. Jim's flight uses two inexpensive Chinese balloons, they cost under US$1.50 each! Amazing that these two cheap balloons have carried the Ultimate3S-based balloon payload for 40 days and 40 nights, and still haven't leaked the gas! 40 days is a new record for a QRP Labs flight. Congratulations again Jim! U3B-14 circumnavigation by David VE3KCL: David VE3KCL launched the 14th QRP Labs U3B test flight on 11-Mar-2018. This flight also uses two of the same balloons Jim is using (a cheap Chinese balloon, under US$1.50 each). Dave is also having a great month, just like Jim (see above): U3B-14 completed a quick and uneventful circumnavigation, and flew right over David's house! Zoom in on the tracking map at http://www.qrp-labs.com/flights/u3b14 to see just how close it was! Remember that a Maidenhead grid subsquare (6-characters) has a limited resolution of a few km. If U3B-14 wasn't so tiny, Dave could probably have looked almost straight up and seen the fly-by! The second lap is still underway (coloured RED on the map below) and today was reported in Tibet. See http://www.qrp-labs.com/flights/u3b14 for the live tracking map. 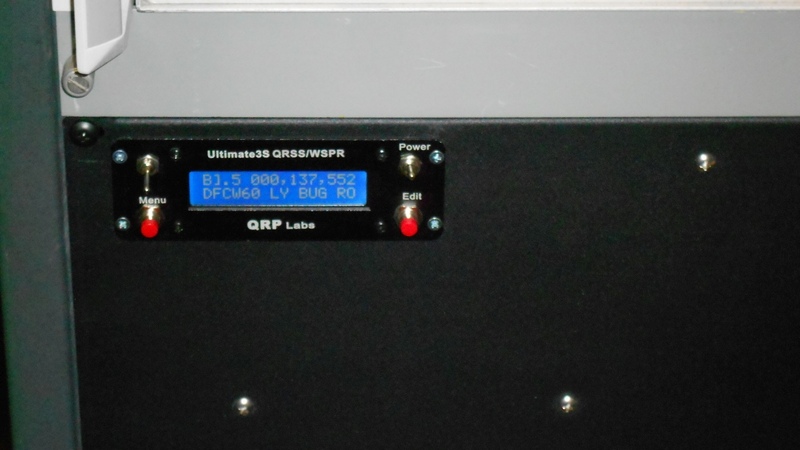 It's always nice to be able to report unusual uses of the well established Ultimate3S QRSS/WSPR/etc transmitter kit. The majority of constructors use the kit for WSPR. But it can transmit lots of other modes too! CW, FSKCW, DFCW, QRSS, Hell, Slow-Hell, JT9, JT65, ISCAT, Opera, and PI4. In all their various flavours. DFCW is very slow CW, sending Morse characters but with both "dit" and "dah" having the same duration; to differentiate between them there is a frequency shift so that the "dah" is typically 5Hz higher than the "dit". It has a very high signal to noise ratio when long symbol durations are used. Chris 2E0ILY and Paul N1BUG report the first ever USA - EU amateur radio QSO on 2200m band (136kHz band), on 26-Mar-2018. They used DFCW mode with 60 second dits and a frequency shift of 0.25Hz permitting a very high signal to noise ratio. 60 second dits in normal CW would mean about 1 word per HOUR! "We used an old technique of night by night transmission sequencing and completed the QSO in four nights which is the minimum possible with this method. This QSO would not have been possible without Chris's kindness and dedication nor without my trust U3S!" "The receiver is a modified Softrock Lite II. The oscillator has been reworked to provide a suitable LO for 2200m reception, the front end filter reworked and significantly augmented. 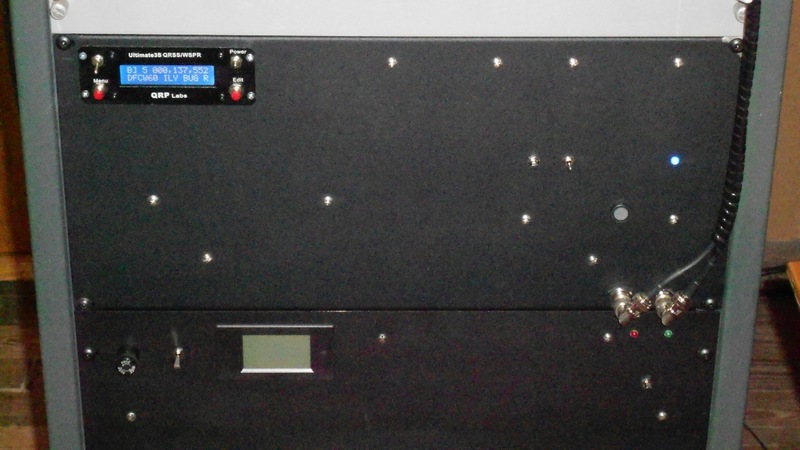 It is preceded by a 2N5109 preamp and BPF." 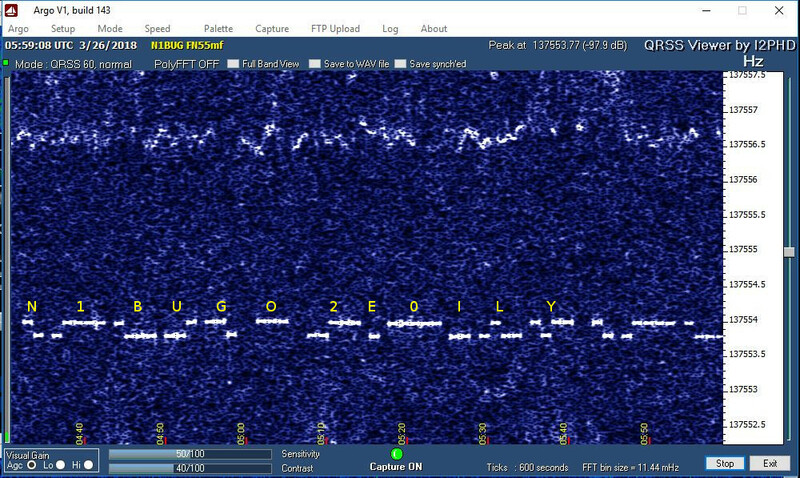 The pictures below show Paul's Ultimate3S, and Chris 2E0ILY's transmission with the "O" signal report as received by Paul N1BUG. Congratulations to Paul N1BUG and Chris 2E0ILY on this achievement!